TRMM (Tropical Rainfall Measuring Mission) is a joint NASDA (Japan's National Space Development Agency) and NASA Goddard Space Flight Center mission dedicated to measuring tropical and subtropical rainfall, an important but poorly understood factor affecting global climate. TRMM, one of the first spacecraft in NASA's EOS (Earth Observing System), returns long-term data on rainfall and energy budget measurements which will be used to better understand global climate changes and their mechanisms. The large spatial and temporal variations in tropical rain make it difficult to measure from Earth's surface, and TRMM provides measurement accuracies possible only from an orbiting platform. The satellite and four instruments are provided by the United States, while Japan has supplied one instrument and launch services. 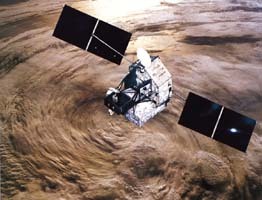 The scientific payload includes: Clouds and the Earth's Radiant Energy System (CERES), a passive broadband scanning radiometer with 3 spectral bands (visible through infared) that measures Earth's radiation budget and atmospheric radiation from the top of the atmosphere to the planet's surface; Lightning Imaging Sensor (LIS), an optical telescope and filter imaging system that investigates the distribution and variability of both intracloud and cloud-to-ground lightning; Precipitation Radar (PR), the first spaceborne rain radar; TRMM Microwave Imager (TMI), a microwave radiometer that provides data related to rainfall rates over the oceans; and Visible Infrared Scanner (VIRS), a passive cross-track scanning radiometer that measures scene radiance in five spectral bands (visible through infrared).